A controversial policy restricting the number of shops able to sell alcohol across Dundee has been renewed by the council’s licensing board. 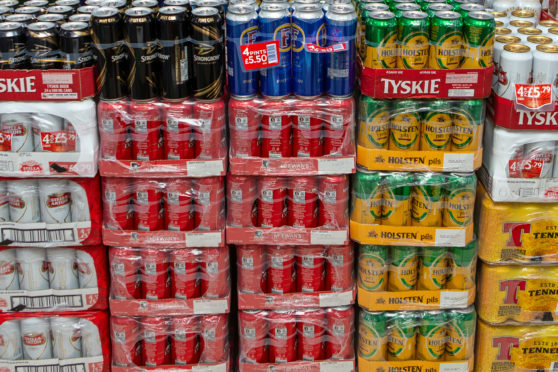 The over-provision policy was introduced in January this year after experts argued the number of off-sales premises could be a factor in the city’s high rate of alcohol-related deaths and ill health. Officers carried out a six-week public consultation on the move, which ended on November 2. Only six written responses were received, including one objection from the Scottish Grocers Federation, which represents Scottish convenience stores. The organisation questioned whether the policy is “fit for purpose” and said it believes a blanket over-provision stance is “not appropriate”. Licensing consultant Janet Hood, who represents many of the city’s licensed premises, also questioned the wisdom of a city-wide policy. She said: “I believe it is important to look to areas of the city which might benefit from having new convenience stores and consider whether the whole city policy is reasonable in circumstances where there is a lack of convenience stores. However, all members of the licensing board agreed to a recommendation that the scheme should continue as part of the Statement of Licensing Policy 2018-2022. A condition has been added to give restaurants and cafes more flexibility in alcohol off-sales. A report to the board stated: “There have been a number of applications recently from premises proposing to operate as restaurants/cafes/refreshments-type premises for an off-sales facility. “In most, if not all, of these cases, the board has imposed a condition on the premises to the effect that alcohol can only be purchased for off-sales consumption by patrons already on the premises and having partaken of a meal on the premises. Despite the aim to restrict availability of alcohol, the policy still means applications can be granted on a case-by-case basis. The city currently has 131 off-sales premises, an increase of two since the restrictions were put in place. Police Scotland and NHS Tayside will soon report up-to-date figures on the policy’s impact on crime and ill-health. Just last week, the measures reportedly resulted in the withdrawal of a plan to turn a Broughty Ferry bike shop into a Prosecco and gin bar.